AS A MINISTER dedicated to education, Br. Gregory O'Donnell is committed to learning. Over his 40-year career, O'Donnell has criss-crossed the country and learned something new in every station. Over the last seven days, the president of Damien Memorial High School has learned something of the sports culture of the Islands. "The people here take their high school sports seriously," he said. "And I knew they took it seriously, but I didn't realize it was to this extent." That lesson became clear after O'Donnell sent a letter to his counterpart at St. Louis School regarding, of all things, a couple of football games. The letter, which informed St. Louis president Fr. Allen DeLong of Damien's intention to forfeit its games against the Crusaders this season, sparked a controversy that has thrust O'Donnell into the spotlight. "I knew there would be a reaction," O'Donnell said. "But I didn't think it would be as intense." O'Donnell said he has returned all of the phone calls that flooded the school office after news of the forfeit broke. He has also accommodated daily media interview requests. While he has received lots of positive feedback, O'Donnell has also endured sharp criticism -- much of it from Damien students, parents and alumni. "There are advantages to being 62 years of age," he said. "And one of them is you've developed patience and understanding and tolerance with people who disagree with you. So I don't feel threatened or challenged. It's nothing personal." While the firestorm he helped ignite has sparked talk of classification for Hawaii high school football -- as well as the tempers of team parents -- his most pressing concern is getting back to running the school. "The biggest problem is the other work I haven't done," he said. "I still have to be the president of the school, but since this went to the front burner a lot of other things have had to be postponed. That's my disappointment." EDUCATION IS THE priority for O'Donnell, a member of the Congregation of Christian Brothers. He joined the priesthood after graduating from Leo High School (which he called "the St. Louis of Chicago"). He was too small to compete on the school's teams, and became an avid fan. O'Donnell began teaching in Vancouver, British Columbia, where he also coached football, basketball and track. His career took him to California and back to Illinois where he was the football moderator at St. Laurence High. 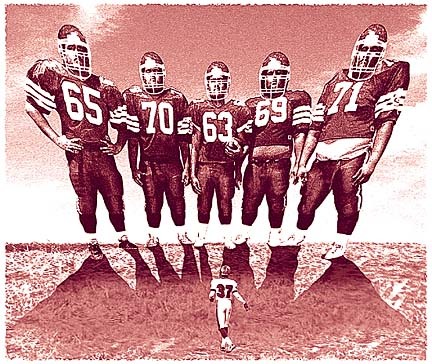 In 1976, the freshman, junior varsity and varsity teams lost one game between them. From 1986 to 1990 O'Donnell was the principal of O'Dea High School in Seattle. O'Dea won the Metro League all-sports trophy in O'Donnell's second year there, and has kept it since. The trophy is awarded to the school with the most successful sports program in the city. O'Dea athletic director and head football coach Monte Kohler worked for O'Donnell. "I thought he was a very fine administrator," Kohler said. "He was fair and very capable. He knew what he was doing and what was best for his school." While O'Donnell is proud of the championships, he keeps on-field success in perspective. "I've been to the mountain, and the mountain's overrated," he said. "I've been with the biggest and the best and when it's all said and done it's still young men playing a game. "My memories frankly are not about wins and losses. I remember individual players and student-athletes. I have memories of people, not scores. "I've been in ambulances taking kids to hospitals. Kids who are in a game playing their heart out and they get injured and they have a knee they limp on the rest of their lives. ... You don't forget that." O'Donnell came to Hawaii in 1997 and took command of Damien, a school of 400 boys in grades 9-12 with the largest percentage of Catholic students in the state (70 percent). He said a committee is exploring creation of a middle school at Damien, which is the state's only private secondary school without seventh and eighth grade levels. He said it could boost Damien's athletic and academic departments. "St. Louis did that some years ago and I'm convinced it helps them and it helps other schools," O'Donnell said. "And it also helps your English program, your history program, your math program to have a young man in your academic flow for six or seven years as opposed to four years." Clay Benham, executive secretary of the Interscholastic League of Honolulu, has worked with O'Donnell on a regular basis over the past three years. "I think he's a very, very sound educator. He's a thinking person," Benham said. "There are times when some of us have a little difficulty agreeing with some of his views, but I have a great respect for the gentleman." O'DONNELL SAID he relishes making "hard decisions which make a difference." He counts the stance of the administration to forfeit the St. Louis game as one of those decisions. He stresses that the decision wasn't his alone, but was made after consultation with principal Michael Weaver and athletic director Herb Lloyd. While O'Donnell stands by the action, he said he has learned not to completely shut the door on anything. He proved his willingness to be flexible by publicly softening his stance on the issue Friday. "Being steadfast is a virtue. Being stubborn is not," he said. But he also promises not to cave in. "Any change will be the result of careful thinking and not a response to pressure," O'Donnell said. Star-Bulletin staffer Dave Reardon contributed to this report.